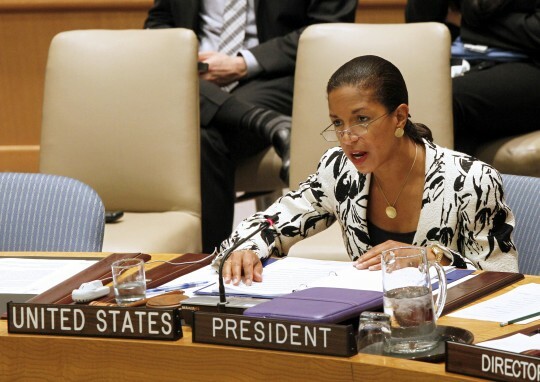 The portfolio of embattled United Nations Ambassador Susan Rice includes investments of hundreds of thousands of dollars in several energy companies known for doing business with Iran, according to financial disclosure forms. Rice, a possible nominee to replace Secretary of State Hillary Clinton when she steps down, has come under criticism for promulgating erroneous information about the September 11, 2012, attacks in Benghazi, Libya, that killed four Americans. Rice has the highest net worth of executive branch members, with a fortune estimated between $24 to $44 million, according to the Center for Responsive Politics. A Free Beacon analysis of Rice's portfolio shows thousands of dollars invested in at least three separate companies cited by lawmakers on Capitol Hill for doing business in Iran’s oil and gas sector. The revelation of these investments could pose a problem for Rice if she is tapped by President Barack Obama to replace Clinton. Among the responsibilities of the next secretary of state will be a showdown with Iran over its nuclear enrichment program. "That Susan Rice invested in companies doing business in Iran shows either the Obama administration's lack of seriousness regarding Iran or Rice's own immorality," said Michael Rubin, a former Pentagon adviser on Iran and Iraq. "Either way, her actions undercut her ability to demand our allies unity on Iran." The companies in question appear to have conducted business with Tehran well after Western governments began to urge divestment from the rogue nation, which has continued to enrich uranium near levels needed to build a nuclear bomb. Financial disclosures reveal that Rice has had $50,001-$100,000 in Royal Dutch Shell, a longtime purchaser of Iranian crude oil. Royal Dutch Shell currently owes Iran nearly $1 billion in back payments for crude oil that it purchased before Western economic sanctions crippled Tehran’s ability to process oil payments, Reuters reported. "A debt of that size would equate to roughly four large tanker loads of Iranian crude or about 8 million barrels," according to the report. Rice has additional investments in Norsk Hydro ASA, a Norwegian aluminum firm, and BHP Billiton PLC, an Australian-based natural resources company, financial disclosure show. Norway’s Norsk Hydro was awarded in 2006 a $107 million exploration and development contract for Iran’s Khorramabad oil block, according to the Wall Street Journal. Rice's portfolio includes an investment of up to $15,000 in the company. Norsk acknowledged at the time that it was working in Iran against the wishes of the U.S. government. America is "not happy that we're there," Norsk Hydro spokeswoman Kama Holte Strand told the Journal at the time. Holte admitted that the company was working with Tehran because it is "profitable." Rice has up to $50,000 invested with another Iranian partner, BHP Billiton, which was probed by the Securities and Exchange Commission in 2010 for its dealings with Cuba and Iran, according to reports. The company, which had leased office space in Tehran, admitted to making more than $360 million from the Iranians, according to The Australian. BHP Billiton sought to build a natural gas pipeline between 2002 and 2005 in conjunction with the National Iranian Oil Company, according the report. The company’s subsidiaries additionally "sold alumina, coking coal, manganese, and copper to state-owned Iranian companies." The House of Representatives passed a bill in 2007 that took aim at these companies and other that had done business with Iran. The bill enabled state and local governments to divest from these companies due to their dealings with Iran. Then-senator Obama proposed and supported a similar bill at the time. It is unclear how White House press secretary Jay Carney will respond to the latest revelations about Rice. Previous questions from the media about Rice's investment in the company building the controversial Keystone XL pipeline were dismissed by Carney as information from "Republican opposition researchers." This entry was posted in Politics and tagged Iran, Middle East, Obama Administration, Oil, Susan Rice. Bookmark the permalink.